Toowoomba Toyota | Toowoomba | What our Guest's are Saying! What makes Toowoomba Toyota? Our Guest's experience is of the utmost importance to all of our staff! Whether your here to buy a new or used vehicle, service your existing one, or bling up your car with Genuine accessories! 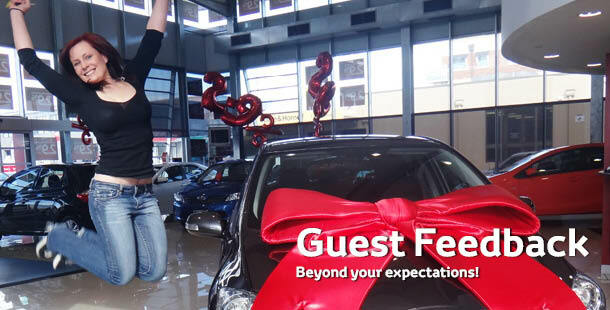 Every Toowoomba Toyota staff member is dedicated to creating an experience for you, that is Beyond YOUR Expectations! We would like to thank all of our Guests that take the time to leave us such wonderful feedback. It is truly appreciated by all Staff and the Dealership. New Vehicle's - What our Guests are saying. "Exceptional Customer Service and the staff at Toowoomba Toyota went above and beyond to make this purchase a easy and stress free endeavour. Both my younger brother and I have bought this same make and model within a month of each other. We are both exceptionally happy with our new vehicle" - Rohan G, Camry. We love our Kluger. We would like to pass on our thanks to Rod and Col firstly who handled the purchase of our new Toyota Kluger. The service we received was excellent. At all times we felt looked after and never felt pressured into a sale. It was the easiest tranaction and was actually a lot of fun! I would also like to thank Jay who handled all of our paperwork and who spoke to us over the phone, it also was a very easy process. We will definintely be back in the future - Amanda and Nathan J, Kluger. Had a great experience purchasing our new car from Toowoomba Toyota. Got a great car for a great price. Our salesperson Dave was awesome as our financial situation took a little while to resolve and he was continuously patient and understanding throughout the numerous phone calls. Overall very happy to have brought from Toowoomba Toyota. Always returned phone calls, very patient with finance situation - happy to wait until we were sorted - Celeste M, Prado. Used Vehicles - What our Guests are saying.